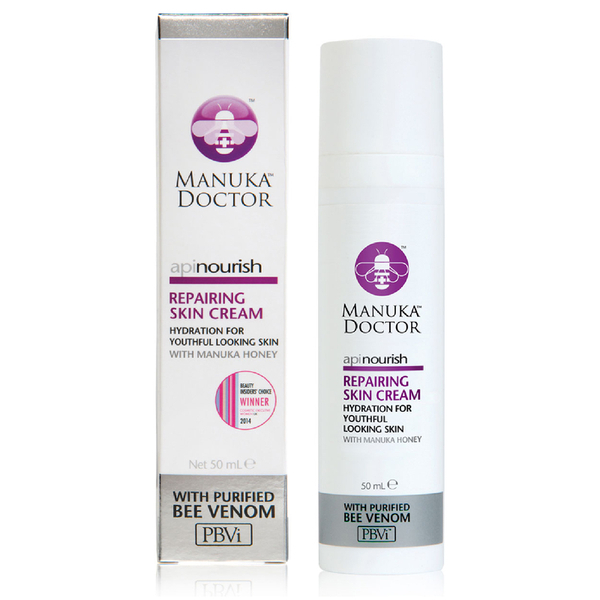 Reveal a more radiant and smooth complexion with the ApiNourish Repairing Skin Cream from Doctor Manuka, a lightweight, non-greasy moisturiser that’s ideal as part of an anti-ageing skincare regime. The silk infused formula is enriched with potent Purified Bee Venom™, royal jelly and manuka honey, which each work together to deeply nourish and replenish skin, boosting collagen production and stimulating elasticity. The addition of Vitamin E protects against free radicals, whilst botanical extracts of Green Tea detoxify and purify. 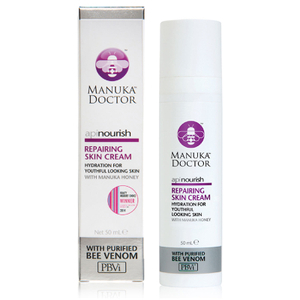 Used as part of your daily routine, you can expect rejuvenated and younger looking skin. Apply to clean skin every morning. If signs of irritation occur discontinue use immediately. Aqua (Water), Cyclopentasiloxane, Butylene Glycol, Polysilicone 11, Glycerin, Dimethicone, Polyacrylamide, PEG-12 Dimethicone, Phenoxyethanol, Dimethiconol, C13-14 Isoparaffin, Allantoin, Hydrolyzed Silk, Hydrogenated Starch Hydrolysate, Glycosyl Trehalose, Dehydroacetic Acid, Laureth-7, Parfum (Fragrance), Viscum Album (Mistletoe) Extract, Imperata Cylindrica Root Extract, Tocopherol Acetate, Royal Jelly, Ethylhexylglycerin, Disodium EDTA, Mel (Honey), Biosaccharide Gum-4, Adenosine, Benzyl Alcohol, Lactobacillus/Soybean Ferment Extract, Camellia Sinensis (Green Tea) Leaf Extract, Bee Venom, Carthamus Tinctorius (Safflower) Oleosomes.